I’ve never met an Australian bagel I didn’t dislike. (I know that’s grammatically a triple-negative, but it feels much better to vent this way.) And yes, if you’re thinking of that place that’s supposed to be really good, I’ve been there. All the Jewish bakeries in Bondi? Yep. That one in Bellevue Hill? Tick. Those places in Melbourne’s Caulfield, St Kilda or Fitzroy. Yessiree. The cool new bakery in Bronte? Love their bread, hate their bagel. I’ve done the research, and the reality is, our bakers just don’t get it. For a country that produces so much good food, bagels are a blight on our record. For some reason there’s an epidemic of round bread going around, an apparently contagious syndrome that takes bread dough, moulds it in the shape of a bagel and produces a dry piece of bread baked as the letter ‘O’. No wonder everyone toasts their bagels – it’s the only way to conjure a sliver of palatability. Oh, and if you feel like mentioning your love of those sugary, alien-looking Aussie abominations called blueberry bagels, don’t do it. Just silently admit to yourself that you really like donuts. And really, wouldn’t you be better off stuffing your face at Krispy Kreme? The shame in all this is that bagel-making isn’t rocket science. That’s what I assumed and confirmed over the past 24 hours in my own experiment of making bagels – which, in truth, put every mediocre bagel I’ve ever bought in Australia to shame. Not only did it turn out to be distinctly possible, it was achievable in my paltry home oven. And most of my bagels shapes were just plain wrong. And some were shrivel-skinned, oblong and with unholy large holes. 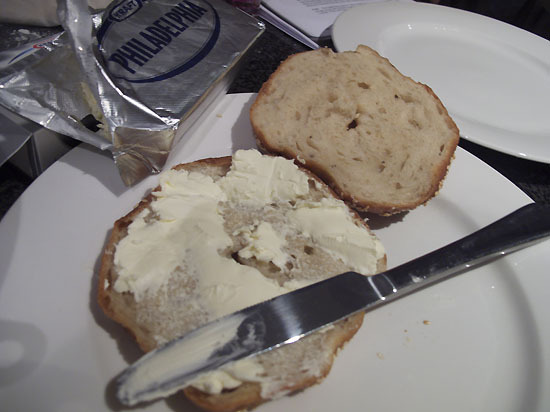 But no matter – they were easily the best bagels I’ve had since returning from New York last October. So what were the keys to my success? Well, let’s start with the challenging cooking method that most bagel-makers around here find difficult to comprehend. Boiling. I’ll say it again. Boiling. Boy-el-eeeng. How hard is that, really? A bagel, is not a bagel, doesn’t even approach being a bagel, can’t be admitted the school of fair-dinkum, real-deal bagel … unless you BOIL it first. Did I say “steaming”? No, I did not say steaming. Did I say “Inject heaps of moisture into your commercial oven?” Nup. but just in case there’s still any confusion, I’m talking about a large pot, filled with water, heated to 100C degrees. It is not optional. It is not an extra step. 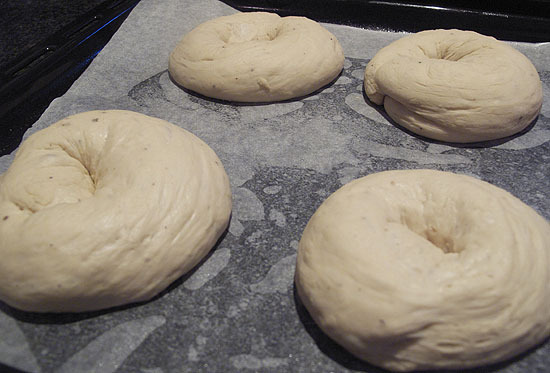 It is the basics – nay, the core essence – for producing a bagel: a beautifully moist and chewy, steamy, flavour-packed yeasty creation with a slight outer crunch that makes for a magnificent contrast in textures. Now that we’ve got that straight, I can admit that making my own bagels wasn’t exactly a cakewalk. First off, I needed to find an inspired, reliable recipe. And after plenty of online research, I can report that there are as many moronic bagel recipes out there as there are cutesy-cringing cupcake blogs and George Dubya Bush highlight reels. Deb, on the other hand, proved her time-efficiency skills by merely raiding her cookbook collection and conjuring Rose Levy Birnbaum’s The Bread Bible. My aquired recipe waxed on for three pages. Deb’s was an eight-page diatribe about all things bagels. We agreed on Birnbaum’s bagel thesis; it be would be our non-simple, no 30-minutes-or-less, no use-stuff-around-the-house, no compromise guide to making kickass bagels. The next challenge was getting the ingredients. 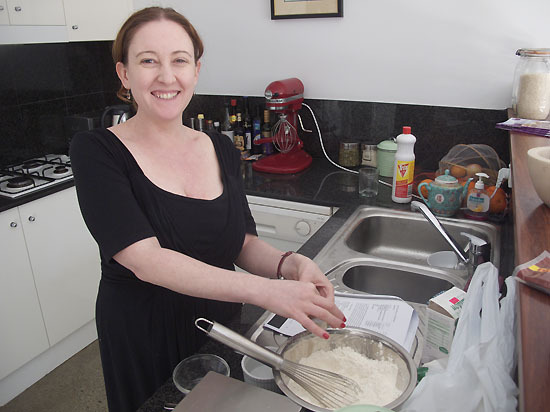 And, really, how hard could it be to get ingredients for making dough? Well, time-frickin-wastingly hard it turned out. Let’s start with our pursuit of bread flour, the real stuff that contains 11-15% gluten to get the texture, taste and structure you want. Botany’s Brasserie Bread has been my favourite go-to bakery for all things leavenly, but they were closed for the holidays. So hoping to stay close to home, I started my search at Thomas Dux, which had a gazillion types of flour – millet, spelt, organic wholemeal, rice, tapioca, self-raising, pastry, pizza, 00 – but nup, no bread flour. The expensive Italian grocer down the road had multitudes of pasta flour and plenty of semolina, but not a one on the bread front. The health food store? More multitudes of everything, and lots of versions of bagel’s arch enemy – gluten-free flour. By late afternoon I finally hit up Surry Hills’ famed Bourke Street Bakery and was told I couldn’t buy dough there… but that I could buy it from their Alexandria outlet, which now does all the baking. But it was shut. Luckily they still answered their phones, so I hurriedly placed my order (they recommend ordering in advance), all for a whopping $2.50/kg, and ran down the following morning. More wild good chases ensued getting the other key ingredients: malt and molasses. I’ll spare the sordid details and the pleas for help on Twitter, and tell you that I found the molasses at the local health food shop, and the malt, of all places, at Coles. Coles! And adding insult to inquiries, they also had a token bag of bread flour in the baking aisle. Sometimes, you gotta keep things simple. Stay tuned for more bagel madness. But for now, it’s been a long day baking, so this bagel doughboy is off to sleep with the yeast fairies.